We think that every vegan needs a couple of go-to recipes they can whip up any day of the week! Here are a couple of our favorite everyday recipes from our Eat Like You Give a Damn Cookbook! We love you, we want you to eat really tasty food, and this is closest we can get to packing your lunch! I don’t like to waste superlatives. When people say that something changed their lives, I roll my eyes along with everyone else and chalk it up to a familial tendency toward exaggeration. But I’m not kidding or overstating the truth when I say just how much this simple salad has had an impact on my life. It gets my family eating lots of raw leafy greens. It gets my grade-schooler exclaiming loudly and excitedly, “Kale salad, kale salad, kale salad, kale salad!” Mother of the year? That’s me. 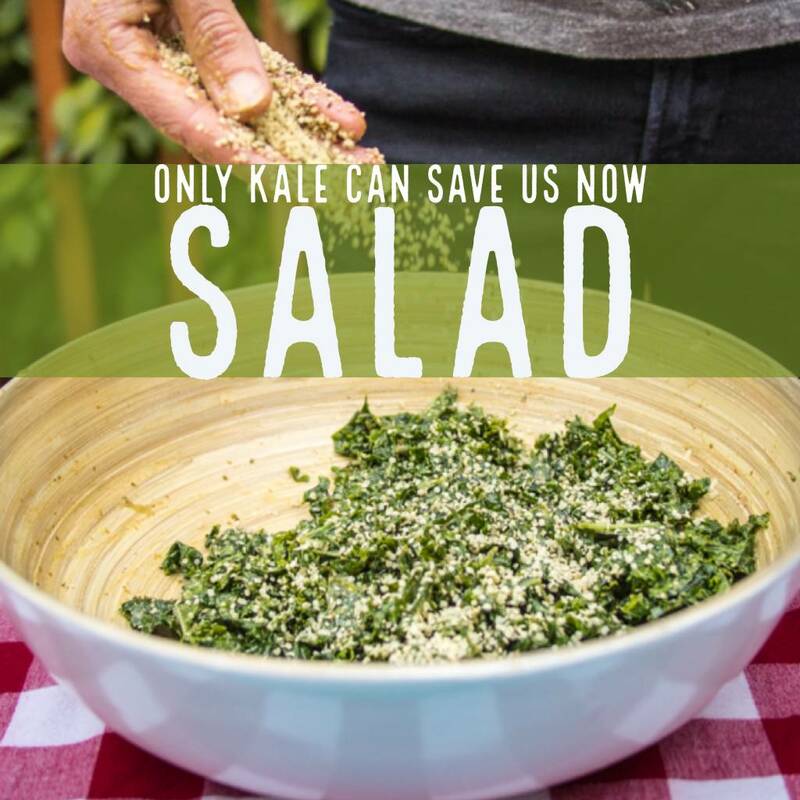 To make the dressing, put the tahini, lemon juice, tamari, nutritional yeast, flax meal, onion granules, and garlic granules in a large bowl (large enough to accommodate the kale leaves). Add the water and whisk to combine, adding more water if the dressing seems too thick. (Tahini varies in consistency). Add the kale leaves to the dressing and mix using your hands. Don’t be shy now! Rub the dressing into the kale and make sure to distribute it evenly. Sprinkle the optional hemp seeds over the top if desired. Serve now or store in a covered container in the fridge for up to 2 days. Tip: Before you get started, you’ll need to clean and prepare the kale. Hold the stem of a kale leaf in one hand, and with your other hand pull the leaf up the stem. When you’ve removed all the leaves from the stems, tear the leaves into bite-sized pieces (you can compost the stems). Give the leaves a good bath in cold water, and spin them dry in a salad spinner. If this is your introduction to tahini, you’ll probably want to start off with a small jar of it. If you’re like us and use this sauce on salads, noodles, and rice dishes, it won’t be long before you’re buying a five pound jug. Tahini sauce is kind of like lemon juice or salt; there isn’t much that it doesn’t go with. Tip: Like all natural nut butters, tahini needs to be stirred well to incorporate the oil prior to use. This Tahini sauce is the perfect thing to slather on a simple bowl with rice, green veg, and tofu or beans. Easy, nutritious, DELICIOUS!